Level Lake Wallenpaupack Lakefront Cottage! Located on the shores of Lake Wallenpaupack. With a westerly view, you can see spectacular sunsets from the front deck. Keep your boat at the dock just steps from the cottage (boat dock is shared with the house - they have a spot for 1 boat and you will have a spot for 1 boat). This 2 Bedroom +1 bath features a master bedroom that has one queen size bed, a second bedroom has a set of bunk beds, small living room w/flat screen cable TV, a deck, bathroom w/shower, charcoal grill, dock for your boat, cable TV, WIFI/Internet, microwave, iron, ironing board, coffee maker, toaster. Both bedrooms have a window unit AC. Non-smoking/No Pets. 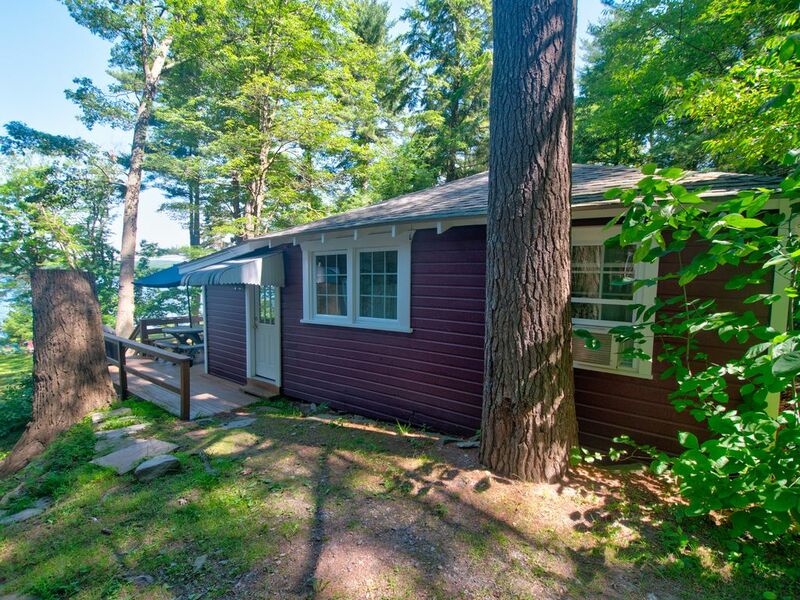 NOTE: this cottage is 470 square feet so it is small but a great getaway for a couple or family with 1 or 2 children. Located off route 507, Paupack. ** HOUSE DOES NOT COME WITH SHEETS & TOWELS - please bring enough for your guests. Grocery store and shopping just 10 minutes away. Lake Wallenpaupack is known for its great boating and fishing! We love this property - it is level to get to the property and level to the lake. The yard is flat. The boat dock is perfect for your boat. The views from the property are beautiful! Enjoy lake living at The Killam Cottage! Lake Wallenpaupack Lakefront Cottage - boat dock shared with the property next door however, you have your own space for a boat. Private fire pit. Refrigerator, stovetop, oven, microwave, blender, coffee maker (drip), & toaster. Outside location was great, the cottage clean, the dock is easy to use. The only one negative, the bathroom is very small and uncomfortable. The cottage is very clean and provides the basics. However we had planned a weekend of kayaking and outdoor fun. Unfortunately it rained all weekend and the cottage is too small to sit around and hang out. The couch is uncomfortable, and living room arrangement does not provide comfortable seating for two or four. Charming. Cozy. Scenic. Peaceful. So much more to say about this little cottage. The location on the lake is ideal and the mornings were tranquil. Spent so much time on the "beach" and the docks, fishing, swimming and just hanging out. The intimate quarters inside meant for close family time at night. Can't wait to go back. Only stayed at this cottage for a weekend but had a great time. This was our first visit to Lake Wallenpaupack and found it pretty easy to navigate the area. The cottage is in a nice spot with direct water access. We wish we stayed a little bit longer.